I have a motivating guest post for you today from Eva who blogs over at Girl Counting Pennies. Eva is one of my oldest blogger friends – we both started our blogs as a way to document our debt payoff progress a few years ago! 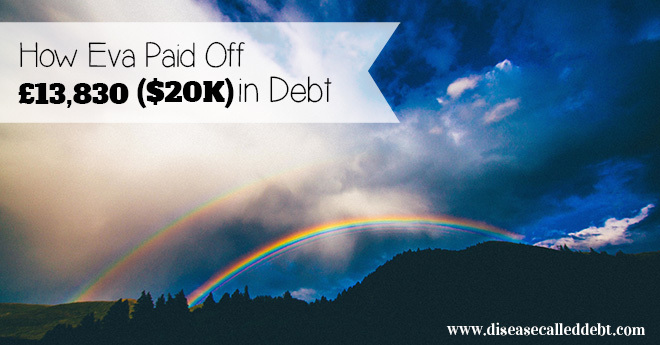 In this post, Eva is sharing her debt success story. For more stories like this, check out my debt success stories section! I got into debt when the first opportunity presented itself. I just turned 18 and set up my very first bank account. Shortly after, I took out my first loan. It was a student loan which I qualified for being a university student. However, I didn’t need it for the purpose of funding my education – my university degree was paid for by the government. I could still take it out, and so I did. I liked the idea of having money in my bank account, but I had none of my own because I wasn’t working at the time. So I figured I should take whatever my bank had to give. Once I got my first job, I took out a car loan and bought a brand new vehicle. I figured I deserved it since I was now a young professional with a fancy job and had to look the part. I applied for a credit card and was given access to a large amount of credit. It didn’t take me long to spend it on things I thought I needed. I also make a risky decision of buying an apartment at the age of 21. My parents helped me with a down payment, and very soon I became a proud owner of a brand new apartment in a brand new block of flats. Fast forward to the present day – I rent out my apartment and receive some nice rental income with only a few years left on my mortgage. This is the only financial decision that I don’t regret – luckily, it turned out to be a great investment. Throughout my twenties, I was making one disastrous financial decision after another. I was diligently making minimum payments towards my loans and credit cards while spending my salary on travelling, dining out and other expensive hobbies. I spent ten years living in financial denial and funding a lifestyle I could not afford. 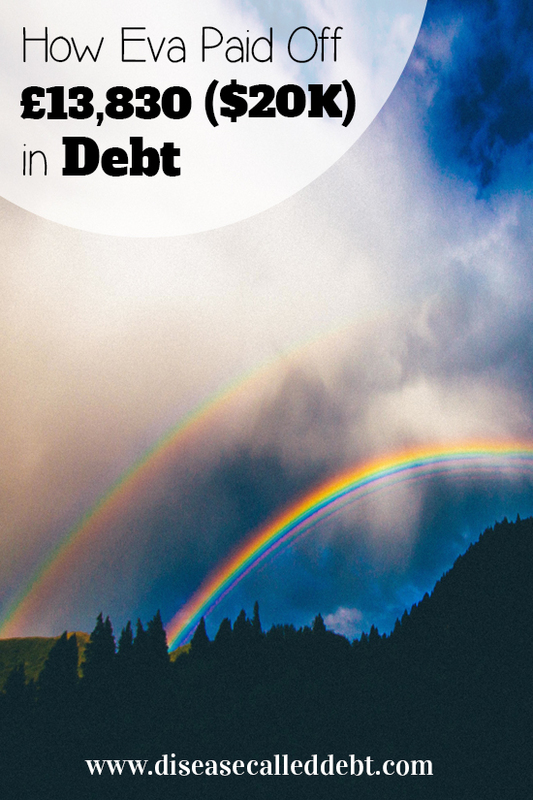 I thought that being in debt was normal – after all, everyone had some sort of debt, right? I finally got a wake-up call in May 2013. I came home from my holiday in Spain where I spent my last penny. All my credit cards were maxed out, and I had no money to live on until pay day. I called my Mum and asked her to lend me some cash. I was deeply embarrassed, and this was when I realised I simply must get out of debt – and fast. For the first time in my life, I was desperate to gain full control over my money and start making better financial decisions. It’s never too late to learn, right? I had a vague idea how much debt I was actually in. I spent hours looking through my bank statements, calling banks to find out the interest rates on my loans and adding up the numbers. That day I found myself in £13,830 (~20K US$) worth of debt – the lowest point in my financial life. Once I made a decision to get out of debt, I mapped out a plan of action. I also started a blog where I documented my journey to debt freedom. I don’t know where I would’ve been without it. Being able to share my progress motivated me to do better and strive for more. First things first, I came up with a debt repayment plan where I would attack my credit card debt first and then move onto destroying my personal loan. I got rid of all my credit cards. I gave up take out coffees and stopped buying magazines. I started to have breakfast at home instead of buying it on the way to work. I stopped going out during my lunch hour – I would pack lunch to work and eat it in the office. I implemented no spend days and would normally have four no spend days each week. I cut my grocery bill in half by downgrading to store own brands and buying discounted items. I was living on £100 a month for three months in a row back in the summer of 2013. This money would buy me food and personal care products that I needed. It was a strict budget – almost unrealistic in such an expensive city as London – but I made it work. I moved out of my expensive flat in Canary Wharf and started to rent a room at my friends’ house – I was single at the time. I sold some unwanted items, such as DVDs and designer clothes. Once I adopted a frugal lifestyle, I was able to save over £1,000 each month and start making huge overpayments towards my debt. Having paid off over £6,000 in principal debt, I made a decision to start travelling again. You see, I love travelling. I had a strict budget to follow whenever I was away travelling. Being able to travel and see the world again was my biggest motivation throughout my journey to debt freedom. I travelled to Italy, Turkey, France, Slovenia, Croatia and other beautiful countries in Europe – all while making big overpayments towards my debt. I do not regret my decision to travel while paying off debt one tiny bit – it kept me going and was a huge psychological lift me up. I made my final debt repayment in December 2014. In the end, it took me 18 months to pay off £13,830 worth of debt. Getting out of debt was one of the best decisions of my life. It was not easy, but so worth it! I have since had a baby, travelled to more beautiful countries and added another rental property to my real estate portfolio. Huge thanks to Eva for sharing her story here. Don’t forget to check out Eva’s personal finance blog over at Girl Counting Pennies to see what she’s up to next. You can also connect with her on Twitter and Pinterest. Do you have a debt success story that you’d like to share? I’d love to feature you if so! Please email me: info(at)diseasecalleddebt(dot)com and we’ll take it from there. Way to go Eva! I know that hard work was involved, but I can definitely appreciate how you kept one thing (traveling) in order to keep you focuses. Getting out of debt and living on a budget shouldn’t be all about deprevation. I have been wanting to try to incorporate more no-spend days into my journey. I’m interested in hearing more stories about people who have done this to see what I need to do. Thanks for sharing your journey with Hayley’s readers. Thank you Latoya! I agree that getting out of debt shouldn’t be all about deprivation. I know myself too well and had I been depriving myself of everything, I would probably still be in debt. To me, travelling was as important. No spend says helped me a lot, it’s much harder to have them now that I’ve got a family – if I don’t spend, my partner will 🙂 but we still manage to have 2 no spend days a week! Congrats Eva. That must have been a tough journey. But now you’re debt free. What exactly do you think that is the most challenging part in your debt repayment journey? Any sacrifices you made? Thank you Jayson! The most challenging part was to live on just £100 for three months back in the summer of 2013. My friends were going out, travelling, attending all sorts of fun events… I missed out on all of that. The hardest part was definitely at the start, once you get into the groove of things, it becomes second nature.It takes some time getting used to the idea of frugal living. I love the fact that you were able to continue to do the thing you valued most (traveling) even while making other sacrifices to end your debt. Congrats on your victory and good luck in your future. Well done Eva! It’s crazy you can take out such amounts of money when you’re so young, just like that. But you nailed it, good for you. Thank you 🙂 Yes, I’m not quite sure what I was thinking back then…I guess I was under the impression I wouldn’t have to pay it back! I’m glad I’m past it now. Congrats Eva! This is a proof that when you plan it, it is possible to be debt-free in a short period of time. Determination and persistence are what I see in you. Congrats! Being debt-free must be an amazing feeling!